The Walkstool Comfort models are made for people who like to feel very comfortable when they sit down. The seats are approximately 40%, 60% and 80% bigger than a normal seat for a three legged stool. The taller the stool, the bigger the seat size. The Walkstool Basic 50cm/20in and Walkstool Basic 60cm/24in are mainly aimed at the mass market. The seat is made of black polyester and is approximately 20% bigger in size than a normal seat for a three legged stool. The legs are grey to match the seat. 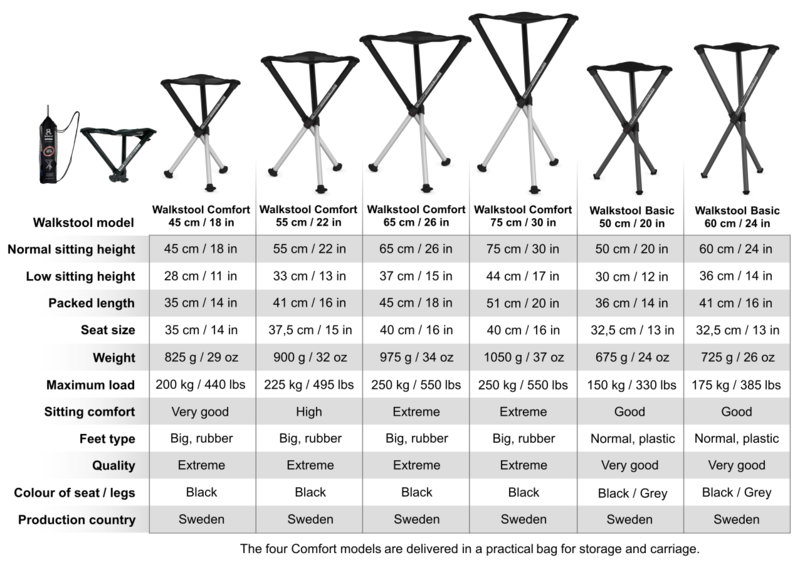 To help you choose the suitable model for you, we want to give you some general guidelines depending on how you want to use Walkstool and depending on your height and weight. The most notable differences between WS Comfort compared to WS Basic is the bigger seat sizes of mesh material and the bigger rubber feet which reduce risk of sinking down when being out in the forest and on wet grass. Please bear in mind that a chair you use in kitchen and dining rooms normally have a sitting height of 45 cm/18in.